Halifax, Nova Scotia is a special place to visit. 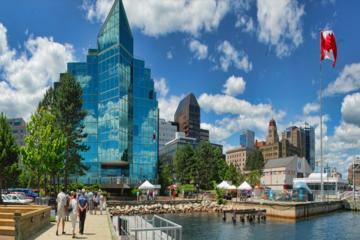 Whether you’re into history, boats, music, or getting outdoors, there’s always something for you to do in in this Canadian Maritime city of 400,000. It’s come a long way from it’s time as a hub on the Atlantic trading route and is now a must-visit stop on any good Eastern Canadian trip. So what do I think are the best things to do in Halifax? The harbour and the ocean are the heart and soul of Halifax so it makes sense to start your visit here. Stroll along the 4km Harbourwalk that will take you past Historic Properties – 3 blocks of fully restored 18th century buildings – museums, and public art like the Wave and the drunken light posts. Do yourself a favour and stop at Rum Runners and pick up a chocolate rum cake during your stroll. Thank me later. One of my favourite things to do in any city is visit their farmer’s market and Halifax is no exception. The Halifax Seaport Farmers’ Market is the oldest, continuously operating farmers’ market in North America and is currently housed between Piers 19-23 on the waterfront. You’ll find fresh produce, tasty baked goods, artisan gifts, buskers, and much more. The perfect way to spend a morning. Another great thing to do in any new city? Climb to the top of something tall and get a bird’s eye view. In Halifax, that means Citadel Hill. Built back in 1749 to protect the city, the star-shaped Citadel overlooks the harbour which means great views. You can also do a guided tour to learn about fort life back in the day. Be sure to snap a pic of the iconic Clock Tower while you’re there. Whether it’s spring, summer, or fall, a walk in the park should be on your Halifax to do list. You can choose between the large, forested, Point Pleasant Park on the southern tip of the Halifax peninsula or the Victorian era manicured grounds of the Halifax Public Gardens. No visit to Halifax would be complete without a night at the Lower Deck drinking bottles of Keith’s listening to a band play tunes like Farewell to Nova Scotia and Barrett’s Privateers. The Lower Deck is a low-ceilinged, small pub that gets pretty packed on weekends but it’s legendary among Halifax pubs. Halifax has an embarrassment of riches in it’s beer brewing scene. Start off with a tour of the Alexander Keith’s Brewery. While it’s mass-produced now, it was the first beer to really be associated with Halifax. Afterwards, get crafty with stops at Good Robot Brewing Company, 2 Crows Brewing Co., Propeller Brewing Co., Garrison Brewing, Granite Brewery, and Gahan House for starters. If you want to sample multiple in one place, pop over to Stillwell. What’re you doing this Saturday night in Halifax? Not sure? Well, put on a little white and neon and head to the Halifax Forum for Cosmic Bingo. Dab your way to a jackpot under black lights with the latest tunes pumping in the background. Bonus: the beer is cheap. Not into bingo? How about a little glow in the dark mini golf? A perfect indoor activity on a rainy day, a round of mini golf at Putting Edge is 45 minutes of out of this world fun. Just run a lint roller over your black clothing before going in. More than just a home for books, the Halifax Central Library is a geometric, glass-walled, community hub. It houses a music studio, two coffee shops, and a 300 seat auditorium. It’s also pretty Instagrammable if that’s your jam. 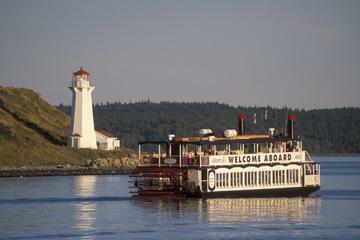 Can’t decide between a bus tour or a harbour tour in Halifax? Do both on the Harbour Hopper. This amphibious vehicle will give you a fully narrated, guided tour of Halifax sights on land before slipping into the water to take you for a spin around the harbour. It’s a bit of a Halifax institution in the summer. Get to know Canada’s roots at the Museum of Immigration at Pier 21. Much like Ellis Island in New York, Pier 21 was the first stop for those hoping to make Canada their new home between 1928 and 1971. Hear first hand accounts of immigrants who made their way here on ships and learn how immigration has shaped Canada into the country it is today. While you’re down on the waterfront, stop into the Maritime Museum of the Atlantic and immerse yourself in Nova Scotia’s rich maritime heritage. Visit Canada’s largest and oldest maritime museum and discover the stories, people and events that have shaped this province and its relationship with the sea. If Halifax had an official food, it’d be the donair. A combination of spiced meat cooked on a spit, lettuce, onion, tomato, and a special sweet sauce all wrapped up in pita has become a legend. We recommend trying this speciality from one of the two shops on Pizza Corner. When a city gets rain and fog as often as Halifax can, it’s no surprise that there would be a wide selection of fun indoor activities. Looking for a little adrenaline rush? Head to Kartbahn Racing and challenge your friends to see who can get the best go kart lap time. Climbing wall, 350 foot Zip lines, 47 Zip lines, Tarzan ropes, spider webs, 50-foot base jump… keep that adrenaline pumping at Ontree Park’s high ropes course. Choose from 14 different courses that will test your physical limits. Want to test your logical thinking, teamwork, and general ability to think out-of-the-box? Get yourself to Trapped Halifax where you’ll have an hour to think your way out of a ‘locked’ room. Pick your theme from medieval prison, contaminated hospital, ancient pyramid, and more. Axe throwing is a sport (game? hobby? pastime?) that many people are surprised to find is not only real, but available outside of hipster enclaves like Austin, Portland, or Brooklyn. Halifax has a local axe throwing joint, Timber Lounge, and they also serve some great snacks. Drop in and unleash your inner lumberjack. Plaid shirt not required. Another great rainy day activity is head to The Board Room Game Cafe. They have a huge selection of board and card games to go with your coffee and cookie or pint and sammie. Want to try a new game but the thought of stumbling your way through new rules is daunting? They have a game boss on hand to talk you through it. One of the best ways to get to know a new place is through their food. And one of the best ways to get to know the food is on a food tour. Choose from one of Local Tasting Tours’ daytime tours or join them for a night out in Halifax, sampling the best in local food along the way. You might think you look silly riding a Segway and…well…you kind of do, but they’re one of the most fun ways to get around so it’s totally worth it. Why walk around Halifax with a guide when you can roll on a Segway? Segway Nova Scotia has seven different tours so there’s sure to be something to suit your taste. 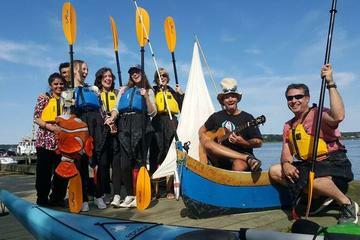 Get your Bard on each summer in Point Pleasant Park. Enjoy Shakespeare’s work performed in a magnificent expanse of nature trails, ruins of colonial forts, and other historic sites with Shakespeare by the Sea. There’s no theatre experience quite like it. The HMCS Sackville is a Flower-class corvette that once served in the Royal Canadian Navy and the last of its kind. It’s now a seasonal museum ship that’s been restored to its 1944 state. You can tour the ship and learn about the harsh conditions of life at sea during the pivotal Battle of the Atlantic. I’ve written before about floating and I’m a big believer in it’s restorative, energizing effects. If you’re visiting from far away, give it a try to beat the jet lag blues or sooth post-airplane pains at The Floatation Centre in Halifax’s North End. 75 minutes in their float tank will put a spring in your step and have you feeling uber relaxed. If food is the best way to get to know a new place, then surely the next best way is through their art. Stop in to the Art Gallery of Nova Scotia on your visit to Halifax and learn more about visual artists with strong ties to Nova Scotia, such as Maud Lewis. Feeling lucky? Whether your game is poker, blackjack, or slots you can test your luck at Casino Nova Scotia on the waterfront. Gambling not your thing? The casino also regularly hosts shows by top-notch talent like Steve Earle and Jann Arden. The Emera Oval, originally known as the Canada Games Oval, is a permanent skating rink/speed skating rink installed on the Halifax Commons. If you’re visiting in summer, just swap out those ice skates for in-line skates and you’re good to go. The best part? You can borrow any gear you need right there at the Oval so you don’t have to figure out how to pack your skates. Nope, we’re not talking ink here. The Royal Nova Scotia International Tattoo is a summertime show inspired by military tattoos given by military bands and display teams. This one is unique in that it also includes civilian performers and has a theatrical flair. Looking for a unique movie experience? Look no further than the 50-foot geodesic dome on the Halifax waterfront boardwalk. Sea Dome features immersive, 360° cinematic experiences. Enjoy one of two different 20 minute films with headphones in big, comfy seats. Whether you’re into cocktails, wines, or craft beer there’s a tour on the tall ship Silva made for you. Or maybe you want to turn it up a notch on the 130’ schooner and hit the dance floor. Yes, the dance floor. Well, there’s an open deck DJ party every Friday night that you don’t want to miss. Neptune Theatre is the largest professional theatre company in Atlantic Canada that perform a mix of modern and classical theatre ranging from local and Canadian-made plays to stories known the world over. If they have a show on while you’re in town, it’s a must-see. Both Wikipedia and Merriam Webster back me up that gardens are a type of park. Either way, it’s a nice place to go for a walk in the city. absolutely adore Halifax and area. Wonderful place to explore. Spent the full day just in the Immigration Museum..then did it again full day at the Maritime museum. You left one thing out of things to do..go geocaching. Did you know Canada’s first and oldest active geocache is not far from Halifax?? You are right re Webster and Wikipedia a garden is a type of park. However, a park is not a garden. (remember the old adage – a square is a rectangle but a rectangle is not a square?) My comment was not to criticize, more i was on my mission to inform. The HPG is a Victorian Garden, the only one remaining in North America and for many reasons, we, The Friends of the Public Gardens (TFPG) capitalize on the “Garden” aspect from an educational and marketing perspective. You can do many things in a park that are not permitted in the HPG and you can learn many things in HPG that you cannot learn in a park, And the name is Gardens, While TFPG truly appreciates being on your site, and the promotions that comes with that, we would greatly appreciate your partnership in our quest to keep in the minds of our visitors that there is a difference. Heard a lot about this place. Loved reading your post and the photos lure me to arrange a trip there soon.